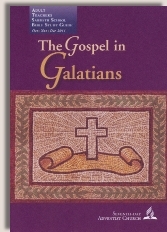 If Wednesday's lesson in the Quarterly has taught you simply that Paul was pitting circumcision against the gospel you have not been studying the book of Galatians deeply enough. Judaizers had slipped into the congregation(s) at Galatia and had started to poison the waterhole by mixing law and grace. Were you born again by grace through faith, or by the law? After being born in the Spirit are you being made complete by the law? Did God indwell you with His Spirit by the Law or by grace through faith? Either the Spirit of God is given to you by the law, or by Grace through faith. There's no option to mix the two because that's a lethal combination. And what was done on the cross makes even the thought of mixing law and grace abhorrent. As a new creation we are spiritually reborn. God the Holy Spirit now tabernacles IN US—we become His temple!. We are given a new heart, and mind. We live in the freedom in Christ. We live each and every day unto the Lord because we have entered into the rest of God (Hebrews 4)—our true rest in the Lord of the Sabbath. We hold no day above another but hold all days the same. There is freedom and blessed relief from trying to ensure our salvation by keeping laws, or by doing good works, or worshiping on a certain day, or highly elevating the law—all the things that Christ confronted the Pharisees for in the temple. He came to introduce a better covenant not founded on the keeping of laws. God wants you to enter that rest now. He wants you to do the only thing that can give you salvation—trust His finished work on the cross. Then you will be what God desires—a new creation—a Christian!